Hertz has a new promotion for Gold Plus Rewards members to earn double the rewards points on rentals until April 30th (promotion is apparently targeted to Canadian Residents). No registration is required for this promotion though customers have to fulfill the residency requirement based on the T&C of this campaign. Hertz has these type of promotions a few times a year and usually it’s either for double points or a fixed bonus amount per rental (I’ve seen promotions that offered 600 points per rental – very lucrative). This is the first time I’ve seen Hertz tying the eligible participation to a residency requirement, here Canada. I wasn’t even aware that there was still a Vancouver address in my profile before having a closer look at this promo. You can access the promotional T&C here. Your Hertz Gold Plus Rewards member number must be on your reservation to qualify. Member must request to have Gold Plus Rewards points on the reservation to earn bonus points. Only those rentals picked up on or after 3/7/18 and completed by 4/30/18 are eligible. Rentals must be picked up at a point-participating location, excluding Brazil, to qualify. Only your base rental points and President’s Circle® tier bonus (25%) or Five Star® tier bonus (10%) will be doubled. Advance reservations are required. Bonus points will be added to your account approximately four weeks after the end of the promotion. 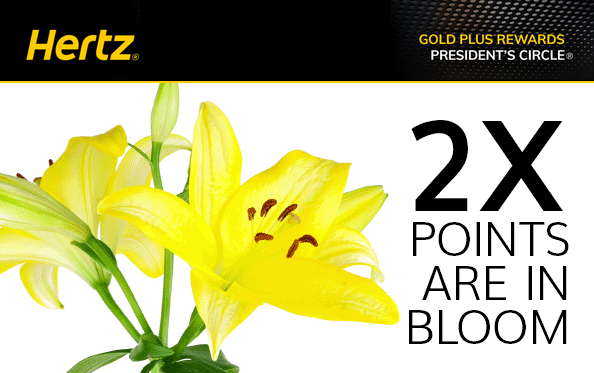 Only select Hertz Gold Plus Rewards® members are eligible for this offer. Residency in Canada is required. As per the terms of this offer, select members are eligible to earn double Gold Plus Rewards points with completed rentals through 4/30/18. For those with a Canadian address on file this might be a good chance to collect some extra points during the promotional time frame. Rental cars in Canada can get quite expensive at times and for such occasions it’s good to have Hertz points in reserve. You might want to check your email account if you’ve gotten the mail from Hertz as it seems the address on file isn’t enough and you might need to be specifically targeted. Last year during peak season I had a weekly rental in Vancouver that Hertz (and other agencies) were pricing at almost $2000 but I ended up using roughly 3000 points and went my way. There will also be a Hertz points purchase offer again during this years U.S. Travel Association’s Daily Getaways. I purchased a large amount of Hertz points there last year for exactly the above mentioned purpose. Hertz Gold Rewards points are an often underappreciated currency. I often see this when talking to friend who say ‘Ah, I just collect miles’ even on very expensive rentals where they get their flat 500 miles per rental or even less when collecting on a U.S. based frequent flier program (even worse: for those programs you’re actually being charged $0,75 per day ‘airline mileage fee’). This particular promotion is obviously limited but there are other ones that will come up over the year that are applicable to all members. I’ll keep an eye on it and post those offers once they pop up.